Guru Nanak is perfect and transcendental Brahm. Guru Angad attained merger in Word by being in the company of the Guru. After Guru Angad, the imperceptible and without duality, Guru Amas Das, the bestower of immortality has flourished. After Guru Amar Das, the forbearing and storehouse of infinite virtues, Guru Ram Das made manifest his existence. From Guru Ram Das, Guru Arjan Dev, who absorbed one in Ram-Nam, beyond all blemishes and immovable one, was born. Then came Guru Hargobind who is the cause of all the causes i.e. who is Gobind, the Lord himself. Congratulations to all of the Khalsa Panth on the Gurgaddi Divas of the master of Sikh temporal & spiritual lifestyle balance (Miri Piri Day Maalak) Satguru Sri Guru Hargobind Sahib Ji. 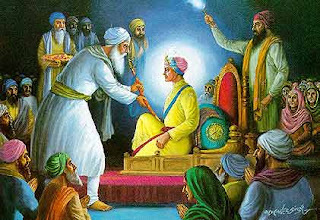 On the day Sri Guru Hargobind Singh Ji ascended the spiritual throne, he asked Baba Buddha Ji to enrobe him with a sword instead of the traditional ‘seli’ (ribbob) of renunciation that Guru Nanak Dev Ji had handed over to his successors. Sri Hargobind Singh Ji bowed to the ‘seli’, but put it aside. Thus, Baba Buddha Ji embosomed Guru Ji with a sword (KIrpan). Guru Sahib Ji asked for another sword, and wore two swords. They were emblems of spiritual and temporal authority, commonly referred to as, the Miri – Piri. They symbolized Bhakti and Shakti. Guru Sahib Ji addressed his Sikhs and urged them bring about a change in their attitudes. He preached on strength and spirituality. 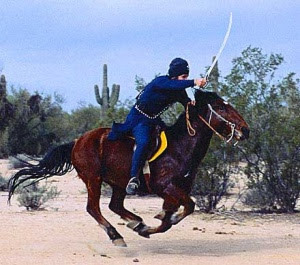 He urged the Sikhs to have weapons and horses, and to practice their defensive tactics on a daily routine. Guru Sahib Ji spoke highly of physical activity in the lives of the Sikhs, through wrestling, Kabadi, Gatka, Horse-riding, and to learn various martial arts. He also wanted the Sikhs to learn how to live in the Jungles and hunt in the jungles. His writings and teachings kindled the emotions from deep slumber and made everyone aware of his basic human rights. Every Sikh should shun fear and dedicate his life to eliminate tyranny and oppression. Wielding the sword to protect the weak and oppressed, to uphold truth and righteousness would become the way of life. This new inspiration and dedication brought about a revolutionary change in the way of Sikh life. During Guru Sahib Ji’s time, Sikhs from across the land came to him, to offer their lives for the protection of Sikhs, all they asked for in exhcnage was shelter, clothing and food. Soon, Guru Sahib Ji had an army of dedicated saint soldiers to serve under his command. Guru Hargobind Singh Ji fought four wars and won all of them. In the forth battle, Guru Ji had to fight aginst Painde Khan, who had deserted Guru Ji and joined the Mughal army. He was a forlorn orphan brought up by Guru Ji himself. He was given education and all the necessary training in the use of all kinds of arms. 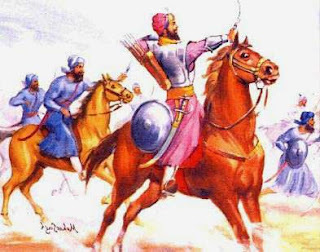 When Guru Ji came face to face with Painde Khan, he gave him the option to strike first. Painde Khan, struck three times, but failed to harm Guru Ji. Then the Master of Miri-Piri gave him a strong and dextrous blow with his sword and Painde Khan was mortally wounded. He fell down from his horse and lying bleeding on the ground. The Master came down from his horse, and took him in his arms. Guru Ji asked him to recite the Kalma as he was dying. The Sixth Guru, Sri Guru Hargobind Singh Ji built the Akal Takht (The Throne of Timeless) and equipped himself with two swords so that no one had to suffer repression and humiliation. He waged four battles. He exhorted the Sikhs to lead a life of independence. He was a soldier and an altruist of unparalleled standing, a far reaching darvesh (seer) who was much sought after in Kiratpur.